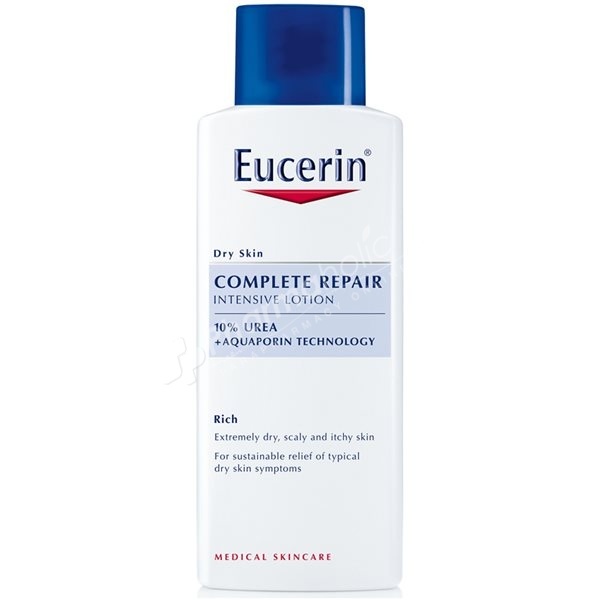 Eucerin Dry Skin Complete Repair Intensive Lotion fights dry skin in three distinct ways, and deeply moisturizes and soothes chapped, scaly and extremely dry skin. Urea and natural moisturising factors (NMFs) bind moisture to hydrate the upper layers of the skin, leaving it feeling smooth and soft. Ceramide-3 replenishes the skin’s natural moisture barrier to prevent moisture loss due to evaporation. Glyceryl Glucoside supports the skin's moisture barrier. Make sure your skin is clean and dry before applying. Gently massage the lotion into your skin until it is completely absorbed. Apply as often as required. Aqua, Urea, Glycerin, Isopropyl Stearate, Dicaprylyl Ether, Glyceryl Glucoside, Sodium Lactate, Butyrospermum Parkii Butter, Nylon-12, Polyglyceryl-4, Diisostearate/Polyhydroxystearate/Sebacate,Carnitine, Cetearyl Alcohol, Ceramide 3, Arginine HCL, Sodium PCA, Histidine, Alanine, Citrulline, Lysine, Serine, Lactic Acid, Sodium Chloride, Mannitol, Sucrose, Glutamic Acid, Threonine, Glycogen, 1,2-Hexanediol, Phenoxyethanol, Potassium Sorbate.